There’s nothing worse than trying to to get a shower with your toddler in the bathroom. You can hear them knocking bottles over, pulling at the loo roll, and will more than likely open the curtain to see them covered in your makeup. 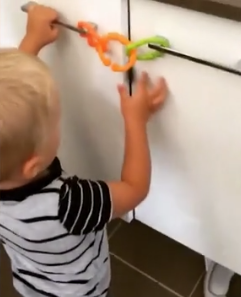 So one mum took to Instagram to share some of her toddler proof tips and tricks to help other pained parents keep their bathroom tidy as they shower. Kimberley Bosley is mum to two toddler son’s aged two and one, who, like most young kids are super inquisitive and like to make mess. 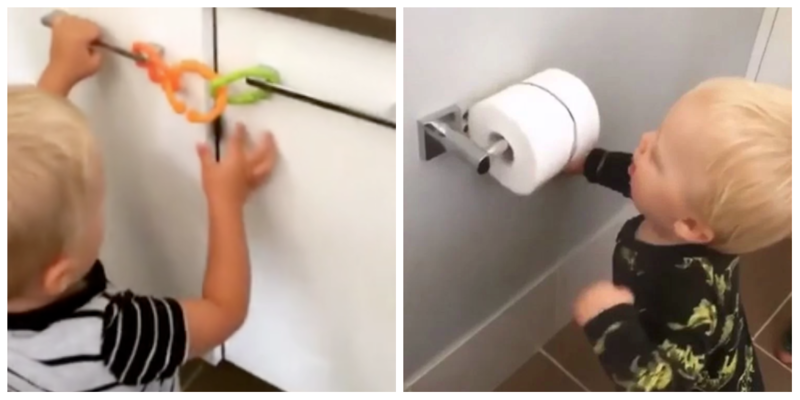 So Bosley came up with a couple of toddler-proof hacks that would keep her curious son’s amused and safe as they explored her bathroom. We all know that unravelled toilet roll can get everywhere, and can be super annoying to re-roll, so Bosley niftily thought of popping a hair bobble around the toilet roll so her son is free to spin it without it unravelling. It’s super easy to pop on and off when you go to the toilet too, but don’t let your toddler see you putting it on incase they work out the trick! The nifty mum also came up with the idea of locking the cupboards with toys to keep them busy and to keep them out! She also has an alternative cupboard toddler proofing method of using cheap dog collars and clipping them round handles. They’re easy for adults to unclip but will keep little fingers out! We don’t know about you, but we’ll definitely be adopting Bosleys brilliant hacks in our house!